“Clean Cuisine” 7-layer salad, featuring Simply Organic Southwest taco mix. Describing the way we eat today requires a complex lexicon of classifications: vegan, paleo, gluten-free, dairy-free, vegetarian, pescatarian, flexitarian, flexivegan … and so on. What about phrases like “clean cuisine,” that don’t describe what we do and don’t eat, but point to our understanding of how food affects our bodies? In their new book Clean Cuisine: An 8-Week Anti-Inflammatory Nutrition Program that Will Change the Way You Look, Age and Feel, authors Ivy Inghram Larson and Andrew Larson, M.D. share how their interpretation of clean eating has revolutionized their health, specifically through an anti-inflammatory diet. There are already quite a few “clean eating” and anti-inflammatory diet and recipe books. This one is differentiated by combining the diet advice with an exercise regimen. While this book contains more scientific detail than others, it also provides a specific — yet flexible — plan to follow. The authors tout a moderate approach to the anti-inflammatory lifestyle and allow meat, dairy, sprouted whole grains and even wine with dinner as part of their plan. Additionally, Clean Cuisine includes dozens of recipes to inspire you to cook clean, including ideas for breakfast, dessert, Meatless Mondays and more. 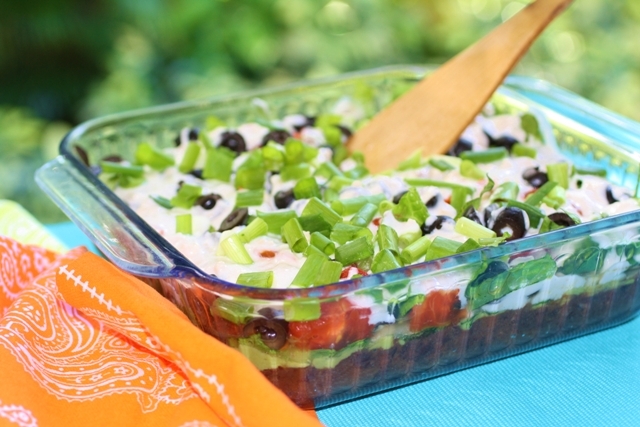 You can find more recipes on the Clean Cuisine website, including one for Healthy 7 Layer Salad (also known as taco dip). To enter to for your chance to win a free copy of Clean Cuisine (and a selection of Simply Organic products! ), tell us what “clean cuisine” means to you in the comments below! **This giveaway is not open to residents of New York, Florida, Rhode Island, Arizona or Puerto Rico. By entering your comment, you confirm that you have read and accept full giveaway rules, available here. 1. Fruits and vegetables organic whenever possible, or soaked in a sink filled with water and 1/2 cup of apple cider vinegar for 15 minutes if thin-skinned and not organic..
2. Fish: Wild-caught, never farmed. 3. Poultry: Free-range and, if diet is supplemented, organic. 4. Meat: Antibiotic and growth hormone-free and is grass-fed (pastured) or wild. 5. Cheese: From pastured cows or goats and, if feed is supplemented, it is organic. 6. Eggs: From poultry as above. 7. Organic spices and herbs. 8. No artificial colors, sweeteners or additives. 10. I personally don’t eat grains, but if so they would be truly whole grains with no GMO. 11. I also don’t drink milk, but if so it would be almond or coconut milk. Being a Certified Health Coach (holistic), I eat clean whenever possible, but relationships always take precedence over the food on my plate. So, if I am celebrating with loved ones, sharing a meal trumps.eating clean by my definition. I eat 100% clean at home, but follow a 90/10 rule in life: At least 90% of the time, I eat clean for my body’s health. Clean eating means not using a lot of processed foods and trying to stay organic and non-GMO as possible. Clean cuisine to me is eating more fruits and vegetables organic of course. More raw foods. Less red meats and more fish, poultry and even pork. Buying meats from grassfed, antibiotic free animals, fed only non GMO grains. Buying organic whenever it is available. Making my own cheeses and homemade breads with whole grains. Actually making as much as I can at home with organic ingredients so I know what is in it. Using heart healthy oils, like olive oil. I have also liked using coconut oil too. Never buying pre packaged foods, I find alternatives always. And not forgetting growing my own herbs so they are fresh and pesticide free. I just snip from my windowsill and put on pizza, salads, or whatever sounds good at the time. Avoiding fast food at all costs. I’d rather pay more for healthy fresh food than a fast food hamburger any day. My cupboard has many Simply Organic spices, just love them, because I know they are grown without pesticides or herbicides. I also use sea salt and not ordinary table salt. Lastly I avoid soda, I have green teas and organic juices on hand. Eating an anti-inflammatory diet which places a heavy emphasis on plant-based nutrition. It means eating from the earth. Not eating processed and food with additives. Clean eating means nothing fried, low fat foods, use olive oil whenever possible, as many raw foods as possible and as much organic food as we can reasonably afford. Clean eating means as much raw, organic food as possible, nothing fried, not very much meat.